When it come to pain management, Laser therapy creates optimal healing conditions and increases healing circulation to help you get back on your feet faster, Discover how our CUBE 4 Medical K-laser is proven to bio-stimulate tissue repair while reducing treatment time and relieving pain. Healing your pain… changing your life The drug FREE, surgery FREE ….SOLUTION!! World’s First 4 Wavelength Therapy Laser which stimulates a Wide Array of Tissues. Continuous & Modulating Frequencies to Promote Pain Control & Healing. 15 WATTS – High Power Delivering Greater Dosage, Resulting in Shorter Treatment Times. Presets that Results in More Consistent and Safe treatment Outcomes. The K-Laser was the first to employ three infrared wavelengths simultaneously and combine them with a visible beam. These Four Wavelengths are more efficient, healing the tissue while also aiding in pain relief. Combine this with Three Distinct Delivery Modes (Continuous Wave, Frequency Modulated, and Intense SuperPulse), and you have a therapeutic laser solution that offers as much variety as the conditions and patients you treat. I have orthotics in both knees. Many tests have been done by my family doctor and orthopaedic surgeon. Dr. Karelis’ NEW Cube 4 K-Laser has been extremely helpful. The change in my knees is remarkable, I noticed a significant difference. Sylvia S.
After one laser treatment with the CUBE 4 Medical K-laser, this is the FIRST TIME EVER that I didn’t experience any major pain. I have felt a great relief and very relaxed. 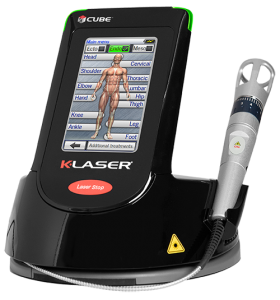 This CUBE 4 Medical K-laser is AMAZING! Thank You Dr. Karelis for introducing me to your new laser. It’s worth trying. Ann M.